A Korean photographer recorded the Marines of CAP 2-7-2 in late March or early April, 1971. 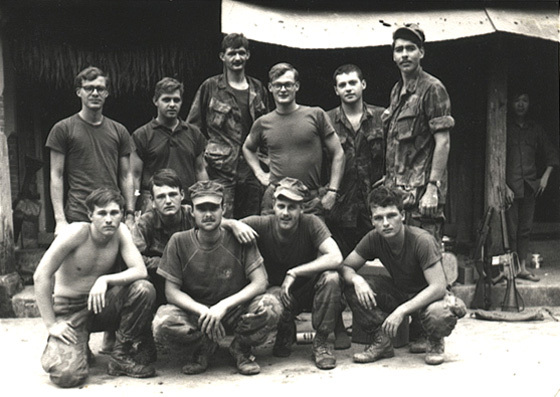 (Back row, L-R) Corpsman Hubert; Sgt. John Paige, New York; Casey “Country” Roach, Colton, Calif.; Unknown Marine; Unknown Marine; Willie Nathan Fulfer, Weatherford, Texas. (Front row, L-R)Larry Thomas, White House, Tenn.; Randy Cook, Indianapolis, Ind. ; Steve “Frenchy” Pelletier, New Jersey; Doug Squier; Steve Maynor, Murphysboro, Ill.